Animal has discovered the list of words that the Department of Homeland Security specifically target when they monitor Tweets and Facebook posts and it's, um, comprehensive. Ever tweet about the weather? Or used 'closure', 'cloud', 'home grown', 'bart', 'subway' or hell even 'social media' in your posts? 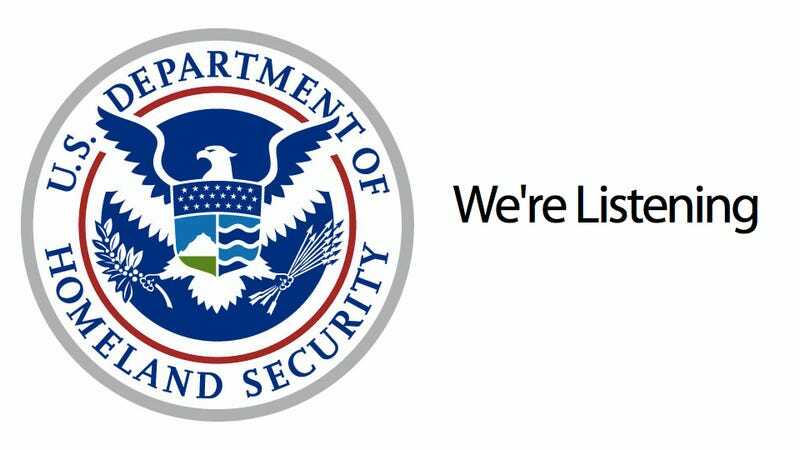 YOU'RE ATTRACTING ATTENTION FROM THE DHS!! I want to Assassinate this Food Poisoning Virus I have. I hope it's not Viral Hemorrhagic Fever. Damn that Pork on the BART, MARTA! That Meth Lab in Breaking Bad is so Agro Terror Sick! Heisenberg started a Drug War with Ricin! El Paso is sooo scary. San Diego makes good burritos though!! Gotta Exercise now! All these Earthquakes, Tsunamis, Tornados and Hurricanes are nuts! Praying! Did you know Cain and Abel were brothers? I hate Scammers on Social Media. Get a life Phreaking losers. Android for life! Shots Fired! Brown Out. You get the idea, all the words in italics are considered "items of interest" to the Department of Homeland Security. It's basically the terms that determine which tweets and posts will be monitored more closely. The words are broken down into eight different categories: Domestic Security (Cops, Gangs, etc. ), HAZMAT & Nuclear (Anthrax, North Korea, etc), Health Concern + H1N1 (Virus, Ebola, etc. ), Infrastructure Security (Airport, Subway, etc. ), Southwest Border Violence (Drugs, Heroin, etc. ), Terrorism (Al Qaeda etc. ), Weather and Cyber Security and the accounts of people who use the words frequently will presumably be looked at more closely.